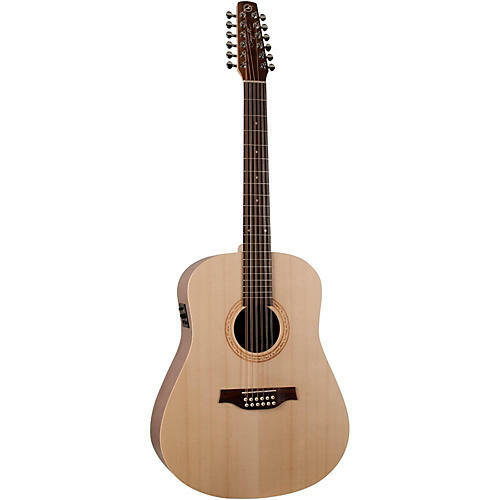 High-quality walnut-bodied 12-string with solid spruce top and Fishman electronics. Made in Canada, the Seagull Excursion Series sets a new benchmark in affordable, quality crafted North American-made acoustic guitars. It was a very difficult task to create a Canadian-made acoustic guitar with this level of build quality while making it so incredibly affordable. However, Seagull's fine team of luthiers in Princeville, Quebec rose to the challenge and made it happen. A with all models in this series, the Excursion Walnut 12 SG features a solid spruce top, walnut back and sides made of a 3-layer lamination of real hardwood, silver leaf maple neck, rosewood fingerboard and bridge, burn-stamped rosette and a custom-polished finish. Also, similar to the S6 Slim, the Excursion model features the Seagull Slim neck with a 1.72" nut width, which is great for players who are more accustomed to a more traditional nut width. Comes with Fishman Isys+ electronics with Fishman Sonicore pickup and a built-in tuner. Order this sweet Seagull 12-string today!